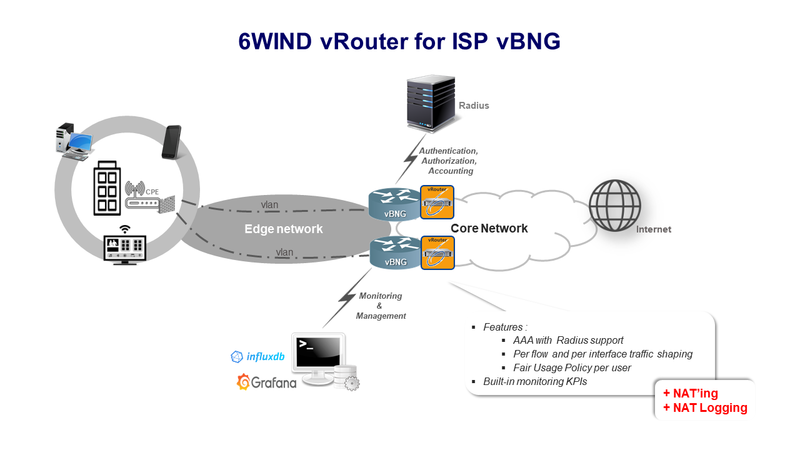 vRouters can be a critical infrastructure foundation to build virtual BNG solutions. When discussing vBNG requirements, we first check performance and features. For performance, with a vBNG, software is replacing hardware, so the vRouter must have comparable high performance. 6WIND’s vRouter has the performance for 14,000 subscribers per vBNG. We deliver 10 Gigabits per second of throughput per core when enabling key features. Our performance scales with the number of cores designated to the vRouter. Subscriber Authentication, Authorization and Accounting features are required to integrate with Radius for policy enforcement and traffic management. Operations and Management features are also important to consider with specific features such as connection monitoring per user. 6WIND’s vRouter delivers both traditional, CLI-based management and IT-style management based on NETCONF interfaces and Yang data models. In the example below, 6WIND’s vRouter is running on a SuperMicro Intel Xeon platform. Using the same hardware platform, 6WIND’s vRouter is capable of handling 3X the number of users per BNG session with 4X the forwarded throughput versus MikroTik’s BNG solution. Here you can see 6WIND’s vRouter deployed within a vBNG solution at an Internet Service Provider customer site. In this use case, 6WIND’s vRouter interfaces with Radius for Authentication, Authorization and Accounting. 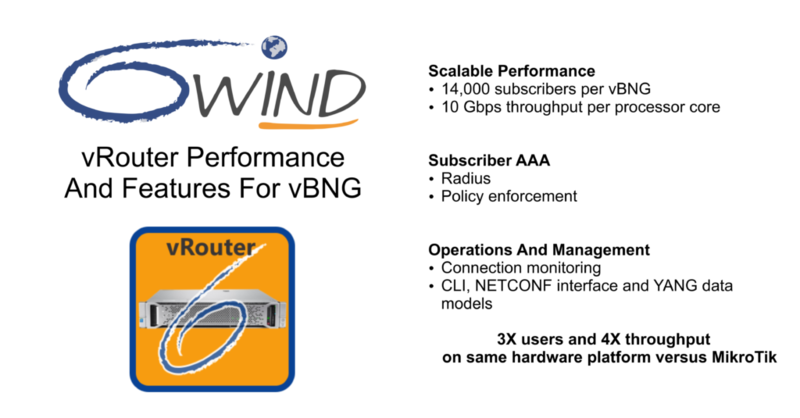 Internet Service Providers can rely on 6WIND vRouter’s rich features including per flow traffic shaping, per interface traffic shaping, and per user fair usage policies to propose a variety of subscriptions plans. These features allow Service Providers to define customer based bandwidth limits so that customers can enjoy their purchased bandwidth per month, at full speed, while prohibiting them from exceeding their total purchased bandwidth levels to make sure everyone gets the best experience from their chosen price plan. All of this is controlled by the Radius. Furthermore, 6WIND’s vRouter has built in monitoring Key Performance Indicators (or KPIs), that in conjunction with influxDB and Grafana, provide a reliable way to centralize monitoring and management of deployed BNG instances. In the use case described here, 6WIND’s vRouter also provides NATing and NAT Logging functionalities. These features are relevant for small or mid-size deployments where a standalone CGNAT solution is out of budget. You can also find these two features in our 6WINDGate CGNAT solution. 6WIND handles all of these functions in our vRouter.